”Hector (Lester) called me on Sunday, and I was here at Silverstone yesterday morning (Tuesday March 21), shaking down his new Ferrari 430,” remarked Allan Simonsen at Silverstone today. 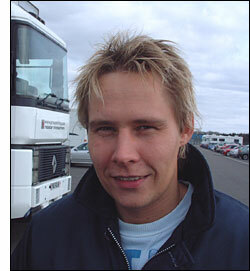 The trouble was, on Sunday Simonsen was in Melbourne…. Success in either of those two races would give the (almost) naturalized Australian a big boost – but he does want to compete in Europe too. “The problem we’ve got with the 430 (initially intended for the Cup Class in the British GT Championship) is that it has 19 inch rims, and Avon doesn’t make 19 inch tyres. We’re looking into changing the suspension and wheels so that we can run 18 inch tyres, but an alternative might be to race in the FIA GT3 Championship. Hector also wants to race it in the Spa 24 Hours. Stephane Ratel said that he didn’t think the GT3 Championship would really happen in the UK this year, and he wants us to race in the European GT3 Championship. “Hector really wants to race it in Britain though – but he still has his 360 from last year, so we’ll have to wait and see what he decides. It’s not a definite commitment to race yet, but Allan Simonsen will be at Paul Ricard this weekend, testing the ‘Danish’ Autorlando Porsche. This is the car being run for Gunnar Kristensen and a fellow Dane – and Simonsen will be helping them out any way he can. Istanbul bound?